Rudyard Kipling was a 19th and 20th century writer of great renown, the most widely read British author of his era, and winner of the 1907 Nobel Prize for Literature. He was born to British parents in Bombay and spent his first six years in India, before being left in the care of an unrelated family in England for what was deemed a more "normal" upbringing (though Kipling said later that he was abused and tortured while in the custody of this foster family). He later attended boarding school at the United Services College in north Devon, and embarked on a career as a journalist and, eventually, a writer of poetry and fiction. His best known work is The Jungle Book, a warmhearted collection of children's stories about a boy named Mowgli, raised by wolves and befriended by other animals in the jungles of India. 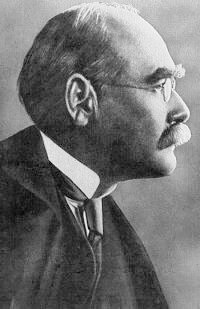 Kipling's other noted works include the poems "If," "The Ballad of East and West," "Mandalay," and "The White Man's Burden," the short story "The Man Who Would Be a King," and the novel Captains Courageous. The artists Edward Burne-Jones and Edward Poynter were his uncles, and British Prime Minister Stanley Baldwin was his cousin. Science fiction maestro John W. Campbell frequently cited Kipling as a key inspiration.